Build the perfect Cat’s Playground and take care of him online! Pounce and play on 3 levels of feline fun! Lower the hinged ramp to let the cat inside to use the scratching post, then put a fish in his dish and a bow in his hair! Make him the happiest kitty in Heartlake City! 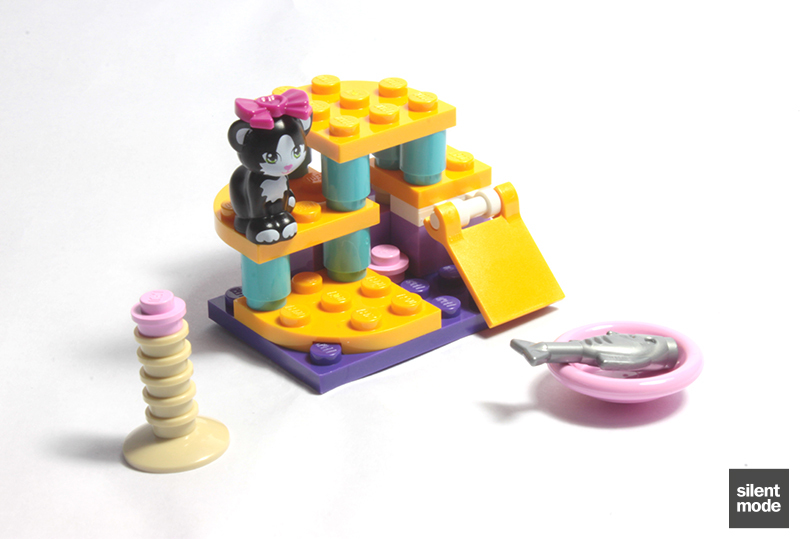 Take care of the cat online at LEGO.com/friends and download more building inspiration. Combine with 41017 Squirrel’s Tree House and 41019 Turtle’s Little Oasis to create a bigger house or playground for all 3 animals, with building instructions available on LEGO.com/friends. Lower the ramp to let the cat into his playground! 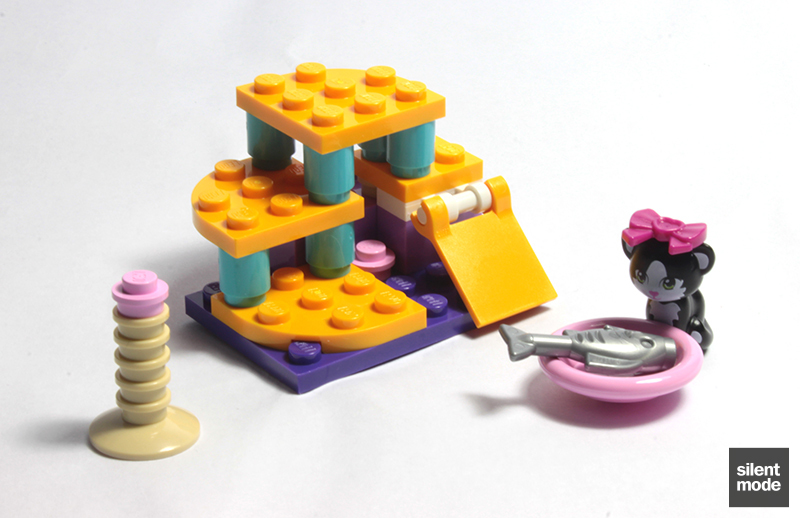 Take care of the cat online, or find more building inspiration at LEGO.com/friends! 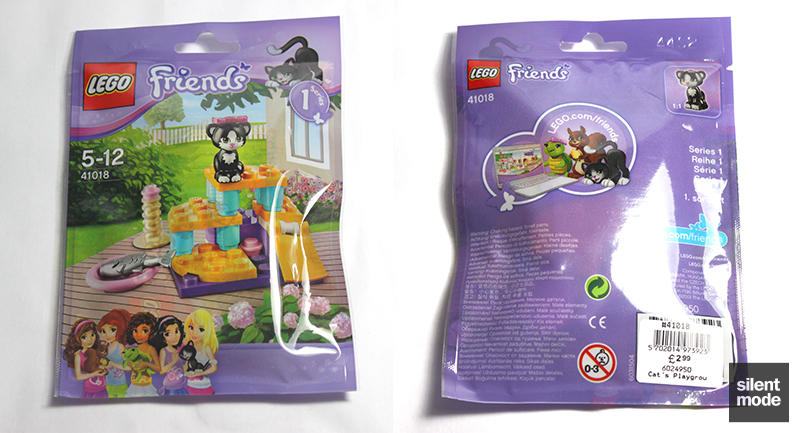 Welcome to the second review of the brand new Friends Collectibles Series 1. Things got off to a great start with Squirrel’s Tree House, now let’s have a look at the Cat’s Playground. 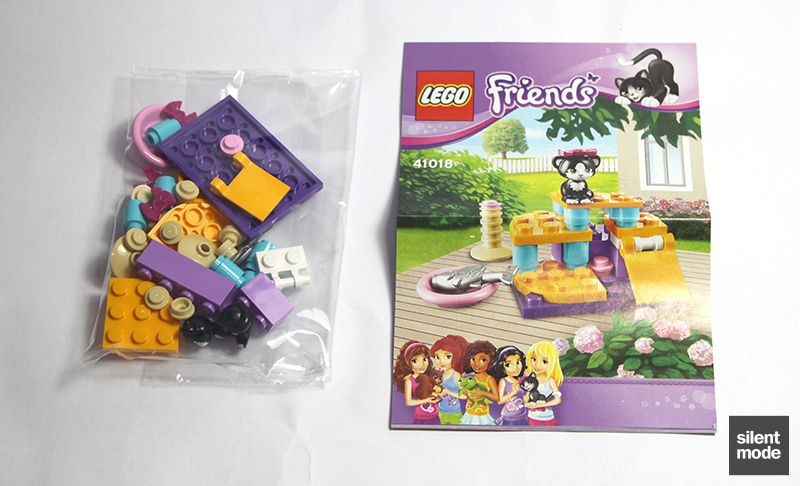 In the same kind of packaging as Squirrel’s Tree House, the front of this set reminds me most of the first wave of Friends, where all those new and reintroduced colours were still new. The combinations of colours makes this look very much like a girly set. Funnily enough LEGO didn’t screw up the apostrophe on their pricing barcode this time; I think someone learned their lesson. The contents are packaged in a similar fashion as before: one clear plastic bag containing all the parts, along with a folded but crisp instruction book. Without the part count shown the packaging, it’s not easy to notice that the cat has ten fewer parts to play with than the squirrel. 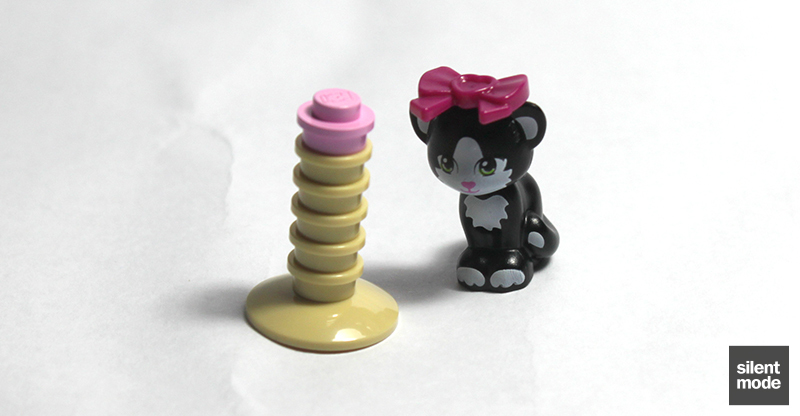 To make up for it, Cat’s Playground has three currently exclusive parts: both Medium Lavender bricks and the Bright Light Orange 3×3 rounded corner plates. Quite a few of the other parts also appear in Andrea’s Bunny House. This time around we have Magenta bows, which also appear in this year’s Mia’s Magic Tricks. The star of the show in this set is this fine-looking black cat… but to everybody’s surprise, despite wearing a Magenta bow it’s a male cat, as described above. It is also unnamed. Though it may be an unfair comparison, I certainly like this cat more than that abomination of a kitten that appeared before it. 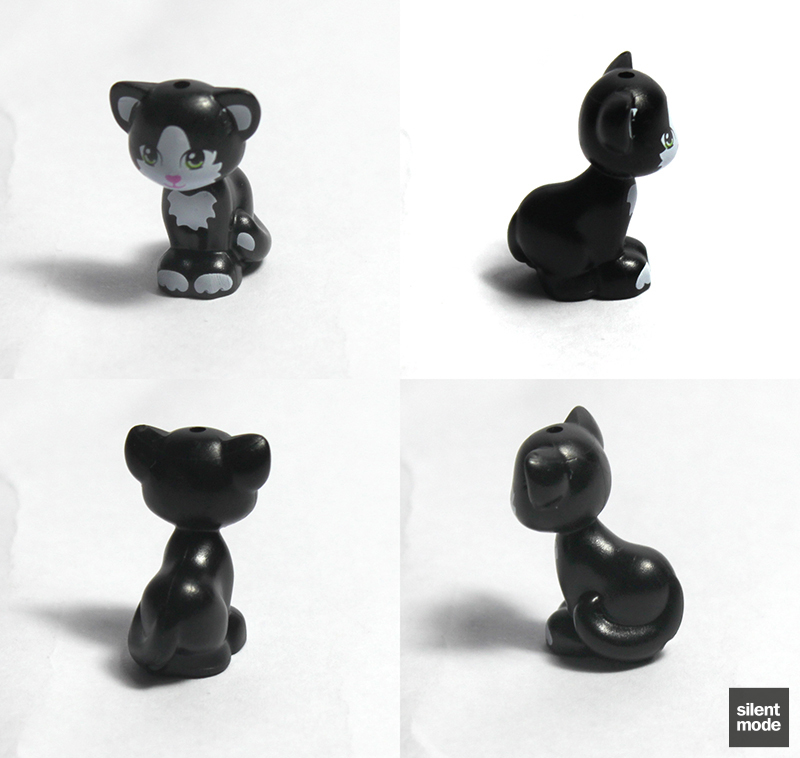 The fact it’s a black cat also adds to the appeal, along with the decent detailing. The accessory goes in the single available space on the cat: on top of its head. Doesn’t he look like a girl? Building begins with a very simple build of a scratching post. The only difficulty here is in knowing when to stop adding those Tan 1×1 round plates! The instruction book insists on using five of them, which gives a suitable height for the cat. The beginnings of the three-level platforms for the cat, which can be completed very quickly given enough space. The 2×4 Medium Lavender brick holds the Dark Purple and White plates together. Those valuable Medium Azure round bricks serve as supports for the platforms, and all of them are used here. All that’s left is to add the remaining Bright Light Orange elements. Not as many leftovers as with Squirrel’s Tree House, but useful all the same. There are two more Magenta bows available if you fancy colour-coordinating your animals (or minidolls). 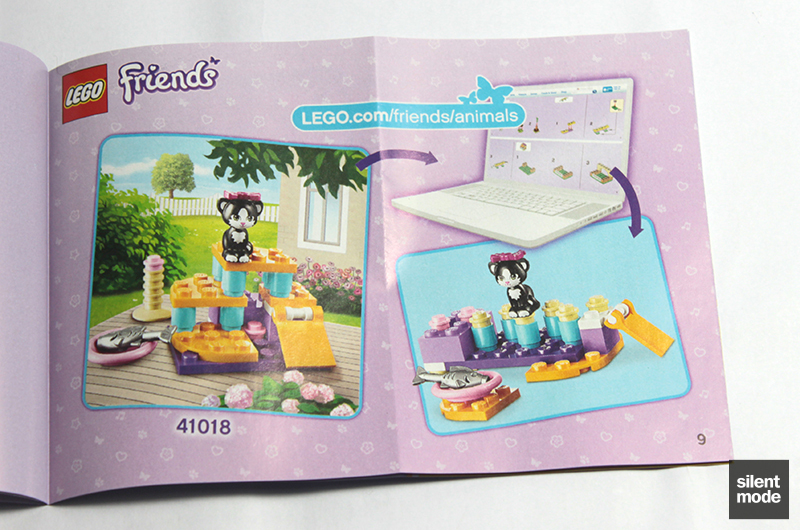 An alternative build for the cat can be found at the back of the instruction book, as well as directions to the LEGO Friends web site to find out how to build it. 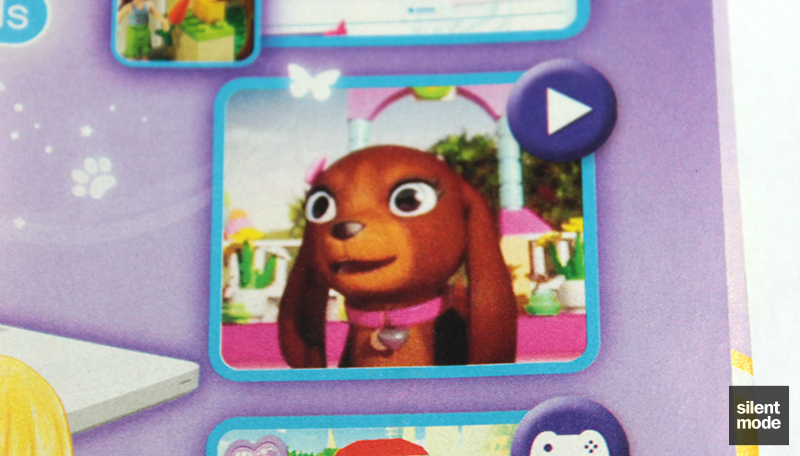 Yet again this creepy-looking dog graces one of the back pages. From now on I’m going to call it Psycho Dog. I like the look of the playground and particularly the scratching post, though Bright Light Orange is very bright against Dark Purple. The cat is well designed, almost making up for that darned kitten. One downside is that the ramp (formed by the flag piece) appears to be useless. A small and very simple build; can be put together in a couple of minutes with no real challenge. Despite the colour combination it was nice to see some of the colours associated with Friends being used more widely. 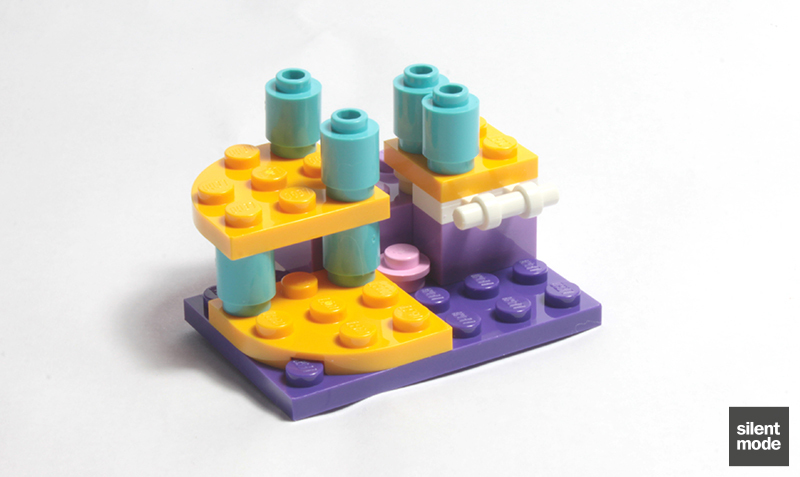 Again almost every part used in this set has a purpose, and can generally be used in MOCs. There's comparatively less interactivity with the playground than with the Squirrel's tree house, but it's easy to position the cat virtually anywhere on the build. Less value for money than Squirrel's Tree House for the number of parts and the parts we get, but still very good value. Based on these scores, cat gets 7.6/10 and barely gets a seal of approval. Stay tuned for the review of the last animal in the series. 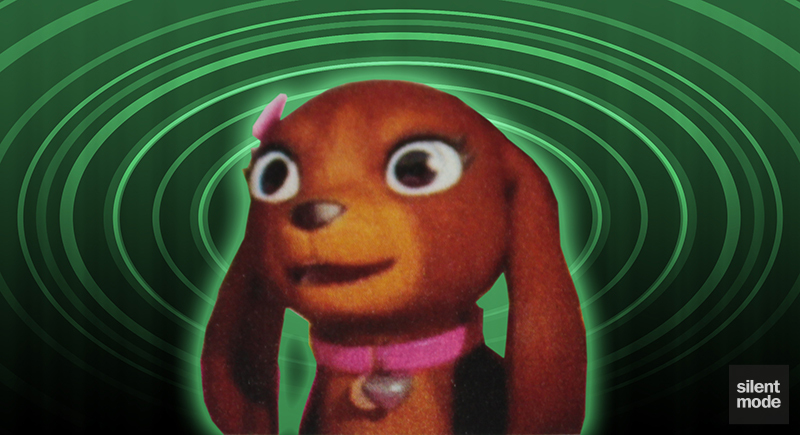 In the meantime, don’t give in to Psycho Dog!